Design West Landscape provides the best landscaping services. We ensure that the highest grade of materials is used and that the best Sod & Hydroseeding goes into your lawns. Hydroseed is nothing but seed and hydromulch. 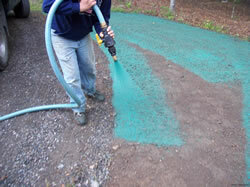 The Hydroseeding we use is made with a specialized binding material. There are some hydroseeding machines that are able to spray only paper mulch products. This can result in a very inferior job and you might end up facing erosion control problems. Sod is different from Hydroseeding and is an ideal option for those who wish to have an instant lawn. Sod is simply grass that has already started growing. Many people prefer this over seeding. Grass sod tends to be much more expensive than seeds but offers fast results. Fescue sod- is available in 3 varieties and it grows best in shady and cool climates. The Tall Fescue is a low-maintenance grass that is used as a mix and is the preferred choice for sports fields and public gardens. We offer you all kinds of Sod & Hydroseeding. Call Us NOW for an Estimate, or for services in the San Joaquin Valley and the East Bay Area.